We received a sample in exchange for this post. Beginning May 1, 2015 through June 30, 2015 Thursday Night Family Nights at Old Country Buffet and Ryan's Hometown Buffet will be welcoming America's favorite fat cat Garfield to the dinner table. 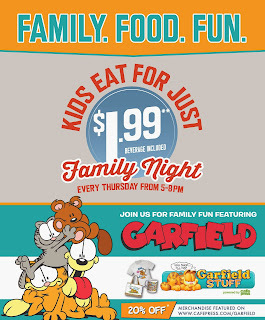 Kids who are dining at the participating restaurants will receive one of three different Garfield & Friends Finger Puppet Perf & Play Adventures, free when dining with their families, any Thursday evening 5 to 8pm, during this period. The fun will include Garfield "Perf & Play" Finger Puppet Show Activities featuring games, mazes and coloring fun. Three differently themed Garfield & Friends Finger Puppet Perf & Play Activities-Make A Splash, Jammin' Out, and Fiesta Fun. The restaurants want to welcome their customers with a new, fun Garfield & Friends experience each time they visit. 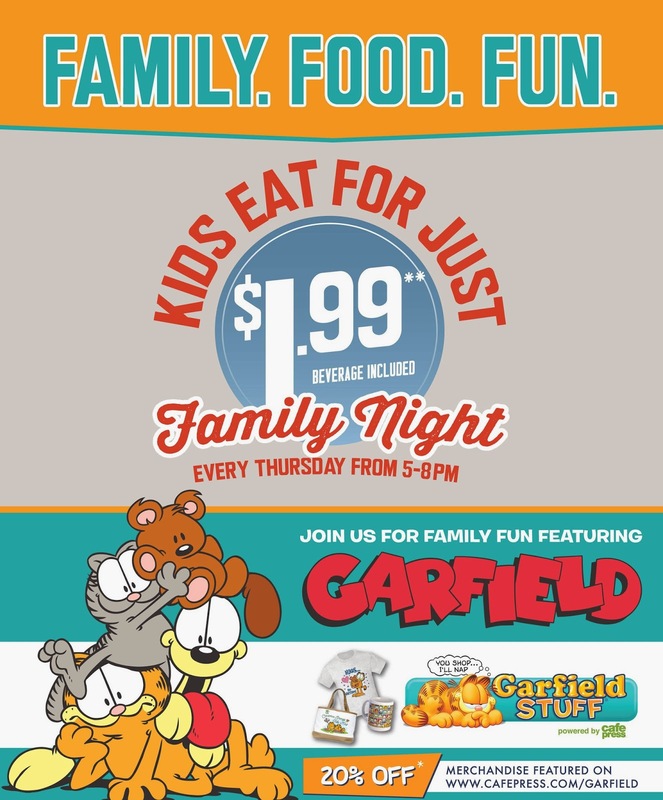 Also, on Thursday evenings kids 11 years old and younger may eat for just $1.99, the Garfield Play Activities are free to all children. "I think we all know there is nothing Garfield loves more than a good meal," said Rob Crews Senior Vice President of Marketing for Ovation Brands. "So of course that makes Garfield & Friends a great fit for bringing some all-ages family fun and laughter to our restaurants and guests." A surprise giveaway just in time for Father's Day! Ryan's HomeTown Buffet and Old Country Buffet want to give one of you 4 Free Meal Passes to any one of their participating Restaurants and a Cool Garfield DVD! How is that for a giveaway, YAY! Must be 18, US only, Sorry friends! Winning e-mail must be received within 48 hours or forfeit. Please give all Mom To Grandma Prizes 6 to 8 weeks to arrive before e-mailing. Please give the RC a moment to load. Any one entry allows you the chance to win, although, the more you do the better your chances. Good Luck All! a Rafflecopter giveaway Disclaimer: Sponsor, not Mom To Grandma, are responsible for prizes and delivery thereof. Fb nor any other social networking site have any part in this giveaway. My husband gave me a break from being a mom on Mother's Day, so I'm going to do my best to give him a break from being a dad on Father's Day. :) A nice day of R&R sounds like a great gift, right? I am not sure what we will do yet for father's day. Usually my daughter and I take my husband out to eat. Then I go to the cemetery to see my dad and wish him a happy day. We are hosting a party for the fathers in our families. We did the same thing for mother's day too. My father passed away many years ago at a young age. I do celebrate Father's Day with my Brother though. We usually have dinner together. Another thing my brother and I usually do in remembrance of our Dad is go through old pictures on Father's Day. I will take the husband out to dinner. That will be about it. I plan to take my husband out to eat or a cookout! We always spend time as a family on Father's Day having a cookout. I don't have any real plans yet. I know my husband, daughter, and I are going to spend the day together. My father passed away at a very young age. I usually spend Father's Day with my brother and have lunch or dinner together. My brother stated he would like to BBQ Hamburgers and Hot Dogs on Father's Day. For fathers day I will be taking my dad out to his favorite place to eat and then maybe a round of golf or two :) Thank you for the great giveaway! We don't have any plans as of yet. No plans so far, but there is a fair and a festival nearby that we may need to check out! We plan on going to the casino. We will probably be going to my parents' house for Father's Day. I'm guessing there will be a cookout. Yum! No plans so far, but there is a fair and a festival nearby that we may need to check out if we have good weather!